The original German term, Rattenkönig, was calqued into English as rat king, and into French as roi des rats. The term was not originally used in reference to actual rats, but for persons who lived off others. Konrad Gesner in Historia animalium (1551–1558) stated “Some would have it that the rat waxes mighty in its old age and is fed by its young: this is called the rat king.” Martin Luther stated “… finally, there is the Pope, the king of rats right at the top.” Later, the term referred to a king sitting on a throne of knotted tails. Medieval scholars have suggested that people may have been under the impression that the rat king was actually one animal with many bodies, with the “king” referring to the animal’s size. Legends have suggested that a “king rat” sat on the tails of the rat king, overseeing the movement of the animals as they attempted to navigate with their matted tails. An alternative theory states that the name in French was rouets des rats (or a spinning wheel of rats, the knotted tails being wheel spokes), with the term transforming over time into roi des rats. The earliest report of rat kings comes from 1564. The rat king was viewed historically as a bad omen, most likely due to rats being carriers for diseases such as the plague. Diseases tend to arise more readily when animals are confined close together, so the rat king would be a breeding ground of disease if it actually existed. The phenomenon may have diminished when the brown rat (Rattus norvegicus) displaced the black rat (R. rattus) in the 18th century. Sightings have been sporadic in the modern era; most recently comes an Estonian farmer’s discovery in the Võrumaa region on January 16, 2005. 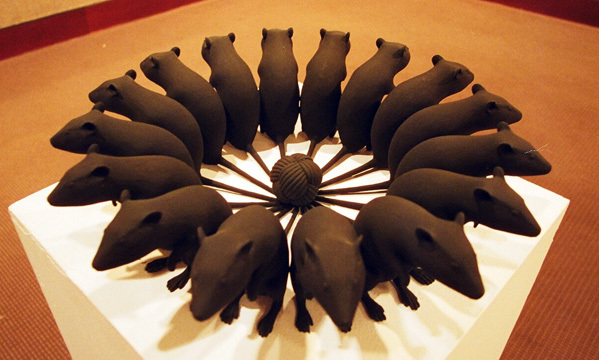 Specimens of purported rat kings are kept in some museums. The museum Mauritianum in Altenburg (Thuringia) shows the largest well-known mummified “rat king”, which was found in 1828 in a miller’s fireplace at Buchheim. It consists of 32 rats. 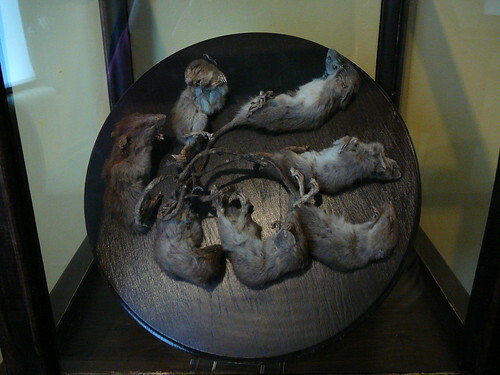 Alcohol-preserved rat kings are shown in museums in Hamburg, Hamelin, Göttingen, and Stuttgart. The Tartu Ülikooli Zooloogiamuuseum (Museum of Zoology in Tartu, Estonia) has a specimen. 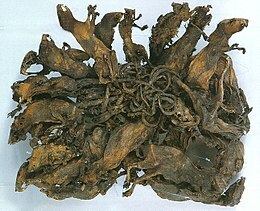 A rat king found in 1930 in New Zealand, displayed in the Otago Museum in Dunedin, was composed of immature Rattus rattus whose tails were entangled by horse hair. Relatively few rat kings have been discovered; depending on the source, the number of reported instances varies between 35 and 50 finds. Most extant examples are formed from black rats (R. rattus). The only find involving sawah rats (Rattus rattus brevicaudatus) occurred on March 23, 1918, in Bogor on Java, where a rat king of ten young field rats was found. Similar attachments have been reported in other species: in April 1929, a group of young forest mice (Apodemus sylvaticus) was reported in Holstein, Germany; and there have been reports of squirrel kings. The Zoological Institute of the University of Hamburg allegedly owns a specimen. The rat king discovered in 1963 by the farmer P. van Nijnatten at Rucphen, Netherlands as published by cryptozoologist M. Schneider consists of seven rats. X-ray images show formations of callus at the fractures of their tails which according to proponents show that the animals survived for an extended period of time with the tails tangled.